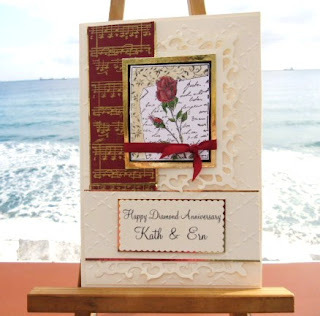 What a stunning card - I think it's so elegant and your friends will love it!! I'll be 100 years old if I get to 60 years!! Well I wasnt expecting that Sylvie, I thought Id call in and see your stunning card and never expected to be drawn in so! Im off to check out the challenge and get the address so I can send a card or three! Stunning card here, what a magnificent achievement to be married for that time! the link isnt working Sylvie! Help! for anyone that wants it! Beautiful Silvie. A gorgeous card for a wonderful achievement, 60 years, wow. I've found It absolutely helpful and it has aided me out loads. I am hoping to give a contribution & assist other users like its aided me. Good job. by brain dead individuals? :-P And, if you are posting at additional places, I'd like to follow anything fresh you have to post. Would you make a list of all of all your social sites like your twitter feed, Facebook page or linkedin profile? I'll definitely digg it and personally suggest to my friends. I'm sure they'll be benefited from this web site. therefore it's good to read this blog, and I used to visit this weblog every day. in Internet explorer. I'm not sure if this is a format issue or something to do with browser compatibility but I thought I'd post to let you know. blogs to read content, but this website gives feature based articles. Hi there, I found your site by way of Google whilst looking for a similar matter, your site got here up, it seems great. I will appreciate when you proceed this in future. Numerous other people will be benefited from your writing.